Cook dal in 3 cups water and set aside. Cook spinach in 1 cup water with turmeric powder, chili powder and salt. Finely grind coconut and cumin seeds in 1 cup water. 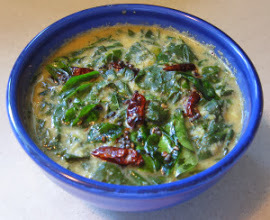 Mix cooked dal, spinach and coconut mix. Boil and then simmer for 10 min. Remove from heat. Heat oil in a sauce pan, add mustard seeds and cover the pan. When the seeds are done popping, add cayenne pepper and curry leaves, stir for 15 sec, and pour into the spinach mixture.